KEMSA's annual awards are a way for KEMSA to honor both individuals and organizations who have made a significant contribution to the EMS profession in the past year. Starting in 2017, we have modeled our awards and nomination forms off the National EMS Awards so that KEMSA's winners can be easily nominated for National EMS Awards the following year if applicable. We have also added a military medic award based on the National EMS Award. 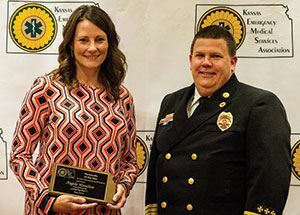 Each year during its annual "Honoring Our Own" Awards Banquet in August, KEMSA honors individuals and organizations in Kansas who have made significant contributions to EMS through various means. There are several individual and organizational categories. For complete details about the awards or to make a nomination, view the information below. Also, view information about the people and services who won in previous years and why they were selected by clicking on a year on the right side. New for 2019: An individual may only receive an award in the same award category once every three years and an organization may only receive an award in the same organizational award category once every three years, with the exception of the President’s Award. 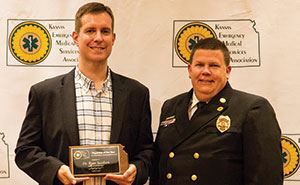 KEMSA requests nominations for its annual awards that recognize individuals and organizations for making a significant contribution to EMS in Kansas in the past year. Anyone is allowed to make nominations unless otherwise noted. All award nominations for 2019 must be submitted electronically by June 15, 2019 using the forms on this website. Incentive: All nominators will be placed in a drawing for one of two free annual conference registrations to be given away. Award forms are available all year, except the month before the annual conference due to allowing time for winner selection. Nominees will be notified after the nomination deadline of June 15, 2019. Award selection will be made by a special committee of EMS Professionals outside the state of Kansas. Award finalists will be honored at the KEMSA Awards Banquet in Mulvane, Kansas on August 10, 2019 in conjunction with the annual KEMSA Conference & Expo. View the KEMSA Awards Committee Policy or e-mail mary@kemsa.org with questions. Below are the award categories and criteria along with links to the online nomination forms. Criteria: Kansas EMT or Paramedic who has significantly contributed to EMS at the community, state and/or national level. Eligibility: EMT of the Year - Any basic or advanced EMT whose primary responsibility is providing direct patient care. Paramedic of the Year - Any Kansas paramedic whose primary responsibility is providing direct patient care. Kansas winners will be submitted to NAEMT the next year for consideration for the EMT or Paramedic of the Year Award. Any other relevant information provided in support of the nominee. Criteria: Outstanding instructor of initial or continuing EMS education. Eligibility: Any Kansas Instructor Coordinator or Training Officer who is recognized by the Kansas Board of EMS to conduct initial courses of instruction or continuing education instruction. Kansas winner will be submitted to NAEMT the next year for consideration for the Educator of the Year Award. Criteria: A military medic* who demonstrates excellence in the performance of military emergency medicine, with their primary role being that of theater patient care. Definition/Eligibility: *Military medic – Any MOS qualified active, reserve or National Guard U.S. Army Medic, Navy Corpsman or Air Force Medic. Kansas winner will be submitted to NAEMT the next year for consideration for the Military Medic of the Year Award. Leadership in helping to enable the delivery of prehospital medical trauma care in the military in austere and dangerous environments with no immediate physician oversight. Criteria: Administrator who has made a significant contribution to EMS Administration on a local, state or national level. Eligibility: Any EMS administrator whose primary responsibility is the direction of individuals involved in the delivery of prehospital care. This is a KEMSA only award. Criteria: Offered to recognize any Kansas licensed physician who provides commendable service to the benefit of EMS in Kansas. The physician can be an Emergency Department physician, service Medical Director or any other physician who has provided a positive impact to Kansas EMS. Eligibility: Any Kansas licensed physician. This is a KEMSA only award. Criteria: Offered to recognize one of the many individuals whose efforts enhance EMS in Kansas through their actions as a First Responder, Nurse, Dispatcher, Law Enforcement Officer, Pilot, Supervisor or other individual who would not fit into the other categories for individual recognition. Eligibility: The nomination can speak to either a continuous positive effort that enhances the quality of EMS or can speak to a specific individual event. This is a KEMSA only award. Criteria: Individual whose contributions to pre-hospital care have been consistent and long lasting, representing in effect, a lifetime of outstanding service to the profession and to the public. Eligibility: Any Kansas Certified EMS professional. This is a KEMSA only award. Criteria: Outstanding individual(s) or group that has shown excellence and dedication to children through pediatric emergency care and/or family centered care. Eligibility: Any healthcare provider, healthcare organization, healthcare association, educator, or child advocate. This is a KEMSA only award sponsored by EMSC. Criteria: Awarded to an individual or team who has been involved in the development of innovative approaches to injury / illness prevention or EMS awareness within the community. Eligibility: Any Kansas Certified EMS attendant or EMS agency licensed by the Kansas Board of EMS. This is a KEMSA only award. Criteria: Paid or volunteer EMS system that exemplifies outstanding professionalism and service to the community it serves. This award honors agencies for their dedication, teamwork, and commitment to EMS. Note on volunteer vs. career: If your nominee agency uses volunteers on a regular basis to provide service to its community, please enter your nomination in the Volunteer Service category. However, please include in your nomination the make-up of the service personnel and any unique ways/success stories for integrating paid and volunteer staff (if that is what is done). Eligibility: Any Kansas licensed Emergency Medical Service, except those in which NAEMT leadership participate. Kansas winners will be submitted to NAEMT the following year for consideration for a Service of the Year Award. See the nomination form for details on what needs to be included in the nomination. If you have questions about any of the awards including the Cara Everhart Award, contact Mary Napier with KEMSA.